This is based on a traditional favourite - jam roly-poly - but is quicker to make as it is oven cooked rather than steamed. The apricot and ginger jam soaks into the light suet sponge, making it really moist. Preheat the oven to 190°C, gas mark 5. Place the flour, sugar, suet and lemon zest in a medium sized bowl and mix together. Add the egg, then stir in the milk, a little at a time, to form a soft dough, being careful not allow to it to become sticky. Roll out the dough on a lightly-floured surface to make a rectangle approximately 30cm x 20cm. Finely chop the stem ginger and place, with the apricot conserve, in a small pan over a gentle heat until warmed through. Spread the apricot mixture over the dough, leaving a 1cm border. Fold the edges over to prevent the jam from oozing out. Brush the edges with a little milk and roll up from the short edge. Thoroughly grease a piece of foil and place the apricot and ginger roll, seam side down, on top. Fold the foil to make a box half-way up the sides of the roll. Place in an ovenproof dish, just large enough to hold the pudding. Cut a few slanting slits across the top of the pudding and brush with 1 tbsp of the ginger syrup. Bake for 25-30 minutes until golden. Transfer to a plate and drizzle with the remaining ginger syrup. 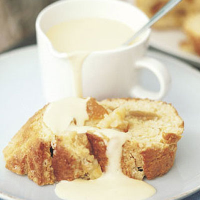 Cut into thick slices and serve immediately with Waitrose Fresh Vanilla Custard and extra ginger syrup. Swap the apricot conserve for your favourite jam or marmalade. Leave out the ginger and brush the outside of the roll with a little milk before baking.